Large woodland garden for you to enjoy. Built in 1853, Birds Nest Cottage, with its woodland garden and riverside location, has been an established Guest House for more than 30 years. All guest and public rooms, have recently been refurbished to a high standard; we pride ourselves on providing a home from home atmosphere with modern facilities in a traditional environment. All rooms have television, tea and coffee making facilities and a hairdryer; ironing facilities are available upon request. They also have en-suite or private bathrooms; wireless Internet connection available. We have two TV Lounges for guests and can offer free DVD loan. Enjoy a massage, hot stones, or hopi-ear treatment by a qualified therapist in relaxing surroundings. 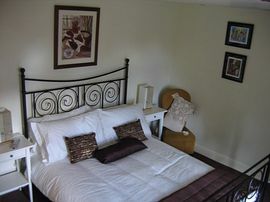 Twin and double rooms are: £27.50 per person per night(£35 single occupancy). Single room: £30.00 per night. Special Diets Provision: Special diets are catered for. Vegetarian and Vegan available.